A 20th Century Christian mystic, Thomas Merton is far and away one of my favorite authors. Although I haven’t read all his books yet, New Seeds of Contemplation is in my mind his greatest work. Without a doubt a modern spiritual classic. The depth of Merton’s spiritual understanding is difficult to grasp. His words are soothing as a pool of cool water. I want to swim in them for hours. In New Seeds of Contemplation Merton takes us to deeper levels in our spiritual walk, teaching us about faith and humility, thoughtfully helping us to find our true identity in Christ. If you are on a serious spiritual growth path, seeking a clearer understanding of your relationship to God, this is the book for you. My feeble words fail when trying to describe the magnificence of Thomas Merton’s writing. Poetic, transcending, life-changing, mesmerizing, core-cutting, astounding, incredibly perfect, a true gift from God. It leaves me almost breathless… Always wanting more. The highest of recommendations from my bookshelf. READ THIS BOOK! In January 2008, I was introduced to Joshua Choonmin Kang when Renavare` suggested their followers read Deep-Rooted in Christ together that year. Because I am such a fan of Richard Foster and the Renovare`organization, I was confident the book would be amazing. I was not disappointed. In the tradition of classic spiritual writers, Joshua uses the spiritual disciplines to show us the path to Christlikeness. Written with 52 short chapters it is perfect for a weekly devotional. There is so much life changing wisdom that once through barely skims the surface. I’ve read this sweet book several times since I first got it. 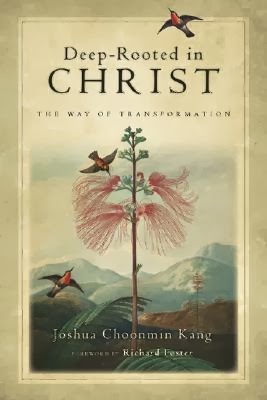 If you are looking for a new devotional for the upcoming year or perhaps a Christmas gift, I would highly recommend Joshua Choonmin Kang’s beautifully written book Deep-Rooted in Christ: The Way of Transformation. I’m looking forward to reading it again myself. I became an immediate Thomas Merton fan when I read this first sentence of Thoughts in Solitude. After living most of my life numbed out in a mind filled with fantasy, I was amazed to find a book written by a Trappist monk that could touch the core of my being with one sentence. Merton’s writing flows like beautiful poetry. You will want to soak in his nourishing words for hours on end. There is incredible healing in this precious book. I’ve read it twice and will read it time and again for the rest of my life. If you are unfamiliar with Thomas Merton, I highly recommend starting with Thoughts in Solitude. It was my first book of his but it hasn’t been the last. Until I’ve read them all I can’t name a favorite, though this one is at the top of the list so far. Benedictine spirituality is unfamiliar to Protestants and Catholics alike. For this reason we must equally welcome Dennis Okholm’s wonderful book Monk Habits for Everyday People. As a Protestant pastor and Professor of Theology, Dennis Okholm helps to bridge the gap with excellent historical background. He unreservedly gives reasoning behind why Saint Benedict’s rule is vitally important to our modern world. When I first began to explore the roots of contemporary Benedictine monasticism, it dawned on me that in one sense Benedict belongs to Roman Catholics no more than he does to Protestants. His life preceded the Reformation by a millennium, and the same Protestants who revere and learn from Augustine (b.354) may just as legitimately, and without feelings of betrayal and guilt, appeal to Benedict (b.480). In Monk Habits for Everyday People Dennis shares stories of his retreats to monasteries. He digs deep into the basic tenants of Benedictine spirituality: Listening, Poverty, Obedience, Humility, Hospitality, Stability, and Balance while giving practical application to all. If you are at all curious about Benedictine monastic practices I highly recommend this resource. Monk Habits for Everyday People is a great beginning place for anyone interested in learning Benedictine ways. One of my favorite things in this book is the list of simple suggestions that help us begin practicing Benedictine spirituality in our every day lives.